The March edition of Wood News Online is out! This month we’ve launched our new woodworking web tv show, The Highland Woodworker, hosted by Chuck Brock and featuring a tour of the Whiteside router bit factory as well as some quality time with Roy Underhill and much more! We’ve also got an impressive mammoth carving done by Elizabeth Anderson, Christopher Perryman’s award-winning “Chest de los Muertos“, and Greg Little’s Louisiana workshop in our regular “Show Us” monthly columns. 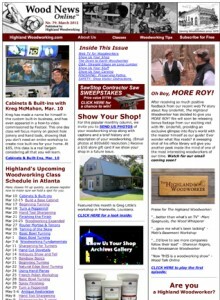 Morton offers a new video product tour of the Lie-Nielsen #7 Jointer Plane, and Steven Johnson considers the art and science of countersinking as well as how to approach woodworking with minimal drawing skills, then builds a corner cabinet in this month’s Down to Earth Woodworker column. Take a look at all this and more in this month’s Wood News Online. You won’t be disappointed!